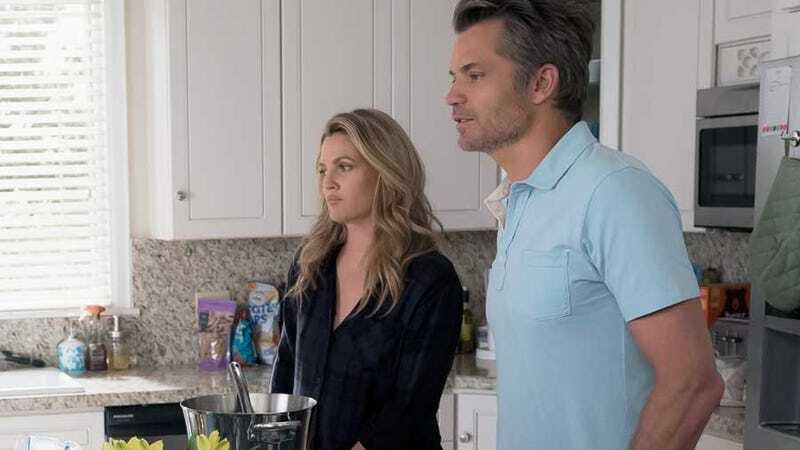 In all honesty, Santa Clarita Diet would be A-OK if it was just wacky hijinks, cute family time and funny lines/sight gags because it does all of those things extremely well and makes for a highly enjoyable, fun little show. But the mystery of the zombie illness is an added bonus and it definitely helps (ahem) flesh out the storylines. Episode four set some good plots in motion in this regard. The big bombshell that happens is that Abby tells her parents about Ramona also being undead and they are understandably very excited about this. If they can figure out what Sheila and Ramona have in common, maybe they can figure out what made them turn undead. They go to Ramona’s apartment and are at a loss for Sheila and Ramona’s shared experiences prior to their death and resurrection, but they do find out that Ramona’s red ball sprouted legs and she keeps it in a glass case like a pet spider. “Mr. Ball-legs” is his name. You’re the best, Ramona. The Hammonds also find out Ramona is responsible for all the recent jogger deaths, so they advise her to be more careful or she’s going to get caught. But that isn’t exactly how they phrase it and what Ramona hears is, “Get yourself a Joel to help you,” so she goes back to Eric and demands he be with her. This coincides nicely with the Hammonds having Eric’s mom Lisa and her girlfriend Anne over for dinner, so Eric brings Ramona and conveys to the Hammonds that he either has to be her boyfriend forever or she’s going to turn him. They’re prepared to take her down to save Eric and a rather awesome fight ensues where Abby is the biggest badass in the room. Abby has a lot of stuff going on right now. She’s dealing the best she can with the zombie thing and the violent, bloody death thing and the best friend getting a girlfriend thing, but all of those things are obviously taking their toll on her. Now, it’s perfectly fine when Abby’s anger manifests itself by her smacking a bully with a lunch tray or saving Eric from Ramona, but the Hammonds need to start paying better attention to their daughter and her problems. Back to Ramona. The fight dies after they all realize she’s just lonely and tired of having to handle all this zombie crap by herself, but she realizes she can’t just force Eric to be her Joel because the Hammonds had built a relationship over decades when the zombie thing hit. It’s a nice realization on everyone’s part and dovetails well with Gary’s Queen of England idea that he posited to Joel. Basically, the idea is that since the zombie thing happened, Sheila has some needs that will always trump Joel’s wants and needs. So he can either just resign himself to that fact and let the resentment build, or he can embrace the idea that he’s second fiddle to an amazing phenomenon, like the Queen of England. It’s some good little character development for Joel, though I suspect he’ll still have times when he doesn’t want to kill someone because he’d rather build a gazebo or whatever. But that’s only natural and at least he has completely accepted that his priorities generally have to change. Once again, the whole sequence is highlighting the kind of marriage the Hammonds have, which isn’t going to just happen overnight. Marriage is work and you have to have a solid foundation first in order to weather something hard, like a zombie virus. As for Ramona, she takes off for Seattle, which is a shame because the character was a fun addition to the season in a bigger role. But when retrieving Mr. Ball-legs from Ramona’s apartment, Joel discovers she ate at “Japopo’s” the same night Sheila did before she turned and they both had the clam special. Do you think Japopo’s has any connection to the man and woman Eric and Abby met coming into Goran’s apartment? Or is it simply that Japopo’s clam special is the inciting incident and those two were procuring Serbian bile for the same reason as Abby and Eric? I hope we revisit them soon, I’m eager to get back to that thread. My theory as to Japopo’s involvement is that the red ball was inside the clam special in a very tiny form. Once inside the victims, it grew until they threw it up and died. I’m not sure if putting the “Ball-legs” creatures out into the world is the end game or just a way to facilitate a bunch of zombies, but I’m assuming the show will tell us soon. Oh, and Gary doesn’t want to die anymore. He wants to watch Kayla turn her life around and see Hayley grow up. So now the Hammonds can’t kill him because they’re too nice of people to do that. Guess they have a pet Gary now. Yes! I’ve enjoyed all the episodes so far, but this one really nailed it. So many good lines, so many funny gags, plus I love the little commentary about how becoming a zombie is turning everyone into who they really wanted to be. The zombieness is kind of a metaphor for dropping your inhibitions and listening to your inner id, to a point. You can’t go crazy with it and start doing the equivalent of indiscriminately killing people, but if you follow your id in moderation, you’ll be a lot happier. Love the .38 Special musical cue, “Caught Up In You” is my jam and I’m delighted that Joel likes it too. I know I say this a lot, but the Hammond marriage is so, so great. My husband and I have “heated agreements” all the time. The look Sheila throws Joel when Ramona tells him to be less judgmental was AMAZING. Drew Barrymore is really funny on this show. When Eric told his mom Ramona broke up with him and that he was very upset and then he shoved the lamp? Actual spit-take. That was great.